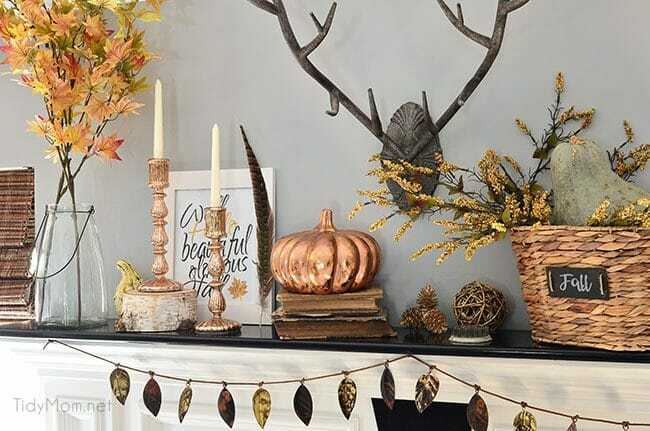 My fall mantel with touches of copper and rose gold is getting me in the mood for fall! It’s funny, when we moved to this house 3.5 years ago, I was so excited about the fireplace. We build a fire nearly every night during the winter, I love the warmth and sound a feel of a crackling fire while we watch TV after dinner. 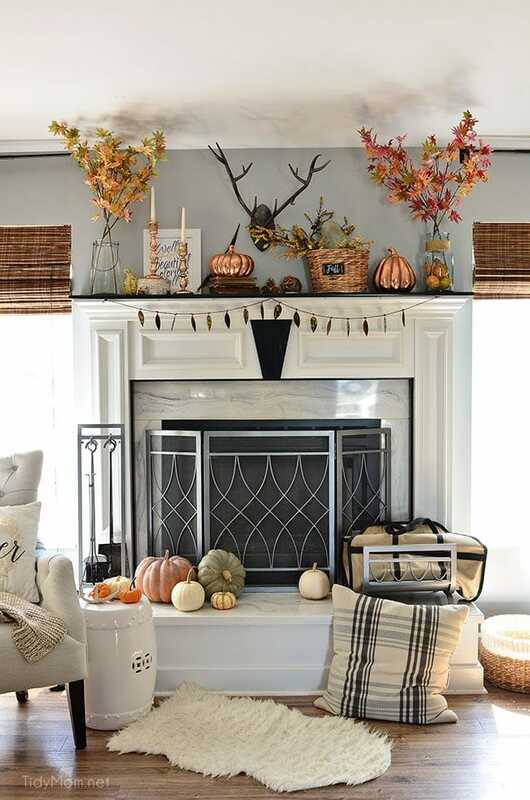 But I was really excited to have a mantel to decorate seasonally. Our weather is not really cooperating either. Every time we get a little chill in the air, we flip right back into the 80’s again. Today should get dangerously close to 90! WHAT…..it’s mid October! I want to wear jeans, scarves, boots and snuggly sweaters. Once a month I take Cullen to the groomer and usually spend that time browsing some of my favorite stores. 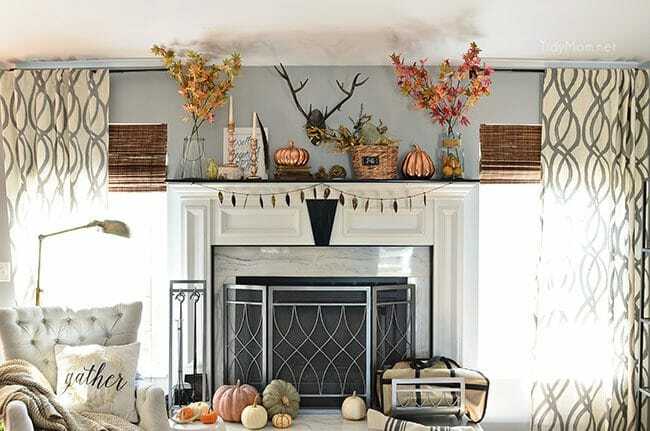 Of course, they were all overflowing with fall decor and suddenly I was inspired to pick up a few things for the mantel. I even made a stop at the pumpkin patch on my way home. I’ve been obsessing over colorful leaf stems simply placed in a glass vase. 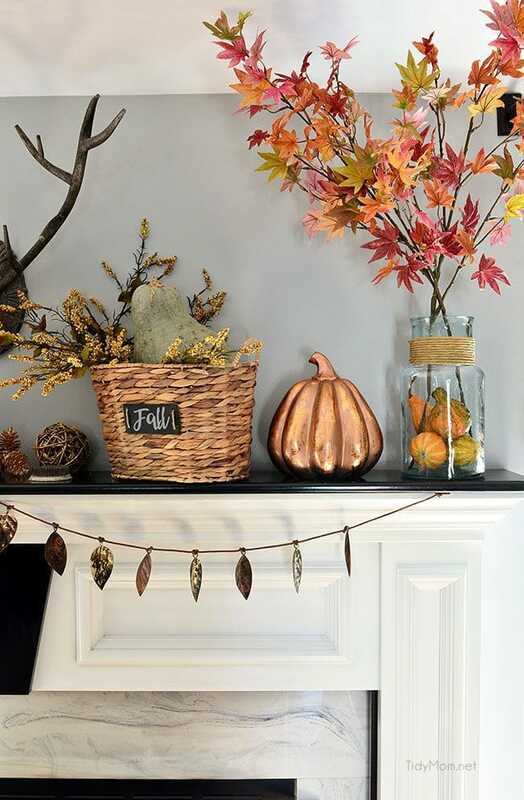 Since our trees are just now starting to turn colors, I couldn’t find any colorful stems to cut, so I picked up a few fall faux leaf stems at Michaels. Aren’t they gorgeous?! I put them in vases that I already had. So simple. How about you? 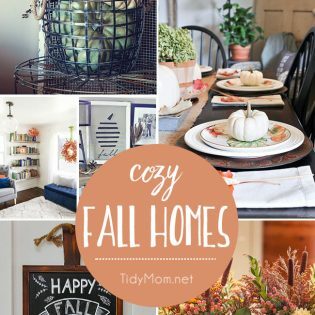 Do you decorate for fall? I love it! I have a pillar candle holder I found at Savers that is a similar color to your candlestick holders. I love it. I wish I had more. 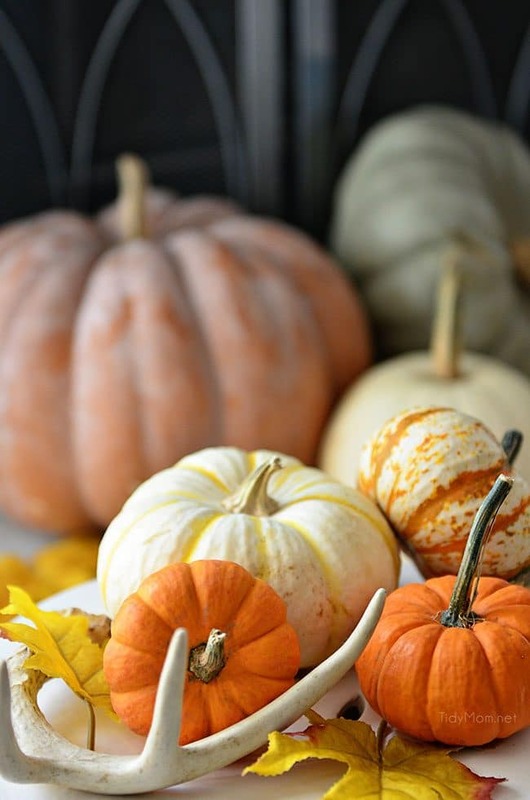 I do like to add few pumpkins or some nice fall detail or two, but I don’t have a perfectly decorated home for fall. 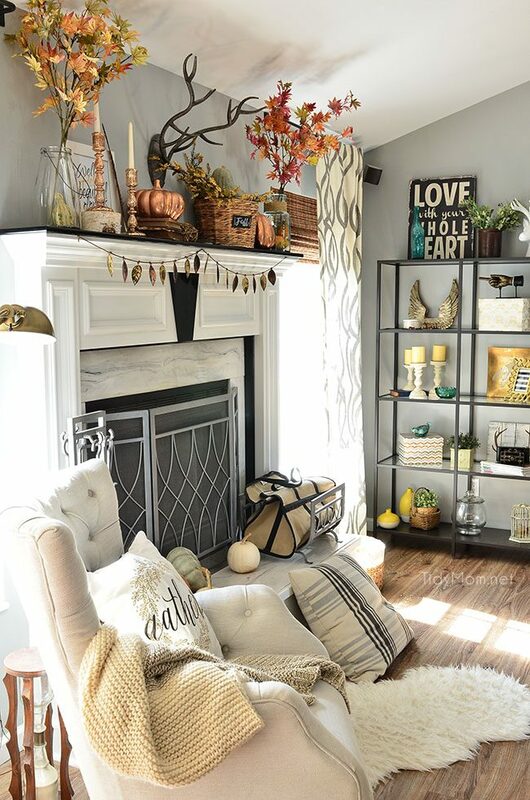 This looks amazing and I absolutely LOVE these copper pumpkins! I have been seeing a lot of copper lately and love it! Looks beautiful! So beautiful, glad I came cross this page!! What is your wall color…love it!! Where did you find the the fireplace screen? It looks great! What a great take on the regular orange for the fall season and halloween. I love this modern rustic flare. Looks great!! I too love your wall color! Can you share? i love the copper, especially with your warm gray walls! great combo. Love the plaid floor pillow! Can you share where you found it? I think I got it at Target a few years ago. I love “everything” about this. Not overly done but still makes a gorgeous fall statement.